John (Jake) Oliver holds a B.A. degree from Fisk University in Nashville, Tenn. (class of 1969), and a J.D. degree from the Columbia University School of Law, New York, N.Y. (class of 1972). He is a member of both the New York and Maryland bars. 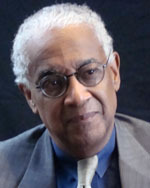 Oliver served two terms (1999--2003) as President of the National Newspaper Publishers Association (NNPA), the trade organization for publishers of Black owned and operated newspapers in the U.S. He also served as president of the Maryland-D.C.-Delaware Press Association. Oliver was the Chairman of the Maryland Higher Education Commission, which provides curriculum and financial over-site of all the higher education institutions in Maryland. He serves on numerous boards such as the First Mariner Bank, the Kennedy Krieger Institute and the Charles Street Development Corporation. Oliver is a life member of the NAACP and the Kappa Alpha Psi Fraternity. For the past nine years, Oliver has been a participant in the Media Focus Group of the Aspen Institute in Aspen, Colo.
John J. Oliver, Jr., CEO & publisher, The Afro-American Newspapers, tells the story of how his family became involved with The Afro-American in 1896 after it was started in a church basement in Baltimore in 1892, and what has happened since he took a leadership role in 1981.